building works going on around hotel which was fairly noisy but nothing compared to the noise from the spanish guests! complained that music and shouting went on till 4am every morning. reception staff could speak little english and shrugged their shoulders when we complained about the noise. childrens entertainment was making pom-poms in the bar area, but the girl could not speak english and did not attemp to include my children. clean modern hotel but unless you can speak fluent spanish not for you. bus drops you off down the hill and you have to pull your cases up and down pavements, but the spanish buses managed to get right to the door to collect guests! 10 - 15 minute walk to beach. Hotel was very clean, staff didn't speak very good English but did try a little. Food was no good if you were a vegetarian, also it was very greasy and ok if you liked fish. Entertainment was very poor. 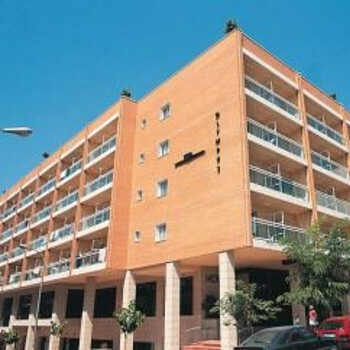 Location was very residential in the old part of Benidorm. Would recommend if you are fluent in spanish and not vegetarian, otherwise I would stay clear. The hotel food was nice, every day it changed. The location of the hotel was great, the best we have had. The staff were extremely pleasant, they were no way rude or ignorant, they joined in the laughs and giggles we had they were diamonds. I would definitely visit the Olympus Hotel again........in 2006. The hotel was full of Spaniards on a Saga holiday. The food was so bad we had eat out every meal. The pool was shut and the hotel was dirty. We are a couple in our forty's who holiday two or three times each year.